In my last post I declared the future is not feeds. 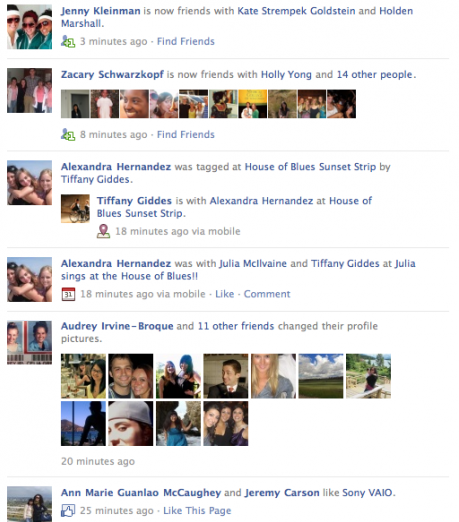 Then, Facebook implemented Ticker — an additional feed of your friends’ activity. Conceptually, I think there’s some merit to it, but in it’s current state, Ticker doesn’t achieve its intent. Plus, visually I think it’s too cluttered. Nonetheless, Ticker and some other changes from F8 show Facebook is making an effort to solve a growing problem. The problem, as I mentioned in my previous post, is that the News Feed has too much data and not enough context. Ticker aims to be a lightweight stream of your friends’ activity — songs they listen to, things they like, comments they make, people they connect with. 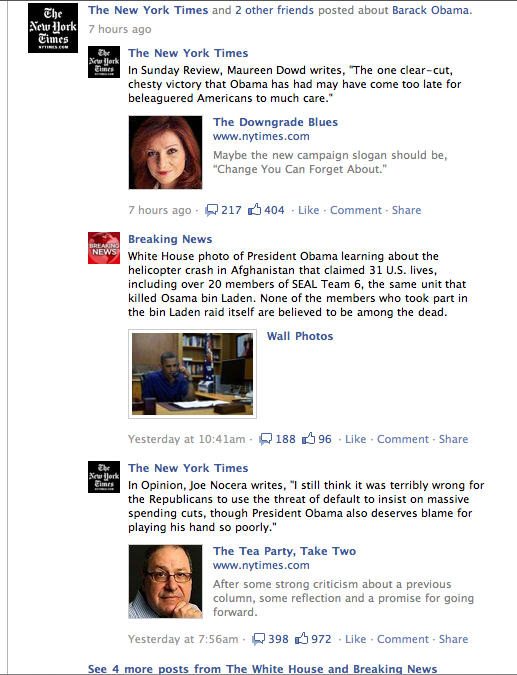 The News Feed has “Top Stories” and more compiled activity. However, the dual feed fails when it shows the same items, especially at the same time. I’m hoping this won’t happen when there are more Open Graph apps sharing general activity in Ticker (“Your friend is listening to a song”) and composite stories in News Feed (“3 of your friends listened to an artist”). What should happen is the Ticker publishes live, or near live, stories that are created automatically by people’s engagement with various apps. The News Feed then is a place for actively shared items and composite stories. And Facebook shouldn’t hesitate to cut some of its own stories (profile photo changes, people becoming friends with each other, people going to events, checking in) unless there is high affinity between users or if the event or checkin is nearby. Otherwise that data should be saved and presented when it’s more relevant. What Facebook has done with Spotify and other music apps is a great start to organizing data in a way similar to what I’ve been envisioning. There are more items that could be added to the music dashboard (page likes, mentions, events) and more dashboards that could be created (movies, news, restaurants), but it still bodes well for a future beyond the feed. Useless and boring — the worst combination. No offense to anyone in my stream. It’s not you I’m uninterested in; it’s the data Facebook is choosing to show me. Because that’s what these stories are: data. It’s all great information for Facebook to collect and store, but it’s not content that should qualify as ‘news.’ I can’t wait until social media data is organized in a way that is more useful to us all. The future is not feeds. The actions we take and information we share online have the potential to be tremendously useful. Of course I want to know what restaurants my friends have been to, but I don’t need Facebook to show me every time a friend checks in somewhere across the country. When I start researching travel or when I arrive in another city, that’s when I want to see that checkin. I’d love to be able to see all my friends’ activity related to movies in one place, so that when I’m deciding what to see this weekend, I can view which new releases my friends have liked, any posts or comments about those movies and any relevant checkins from Get Glue or other services. I want to be able to visit a band’s Facebook page and not only see which of my friends like that band, but what they’ve said about the band, which songs they’ve shared and whether they’ve been to a concert. All of this information is on Facebook’s servers, and it’s inevitably going to be organized this way. Mark Zuckerberg has said Facebook users are sharing twice as much each year. With that sort of exponential growth, it’s obvious the News Feed will have to evolve. The solution is not to generate and view lists of different people. 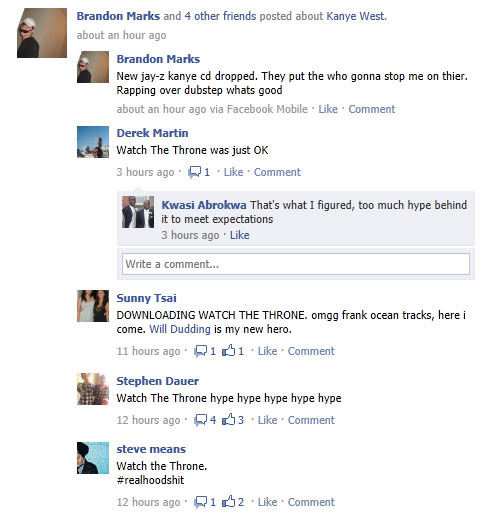 Companies have to organize feeds around content. While Google+ is focused on Circles and Twitter’s biggest changes involve adding multimedia, Facebook seems to be actually pursuing ways to sort posts. This bodes well for a future that moves away from the unfiltered feed and toward highly relevant search results and push notifications. 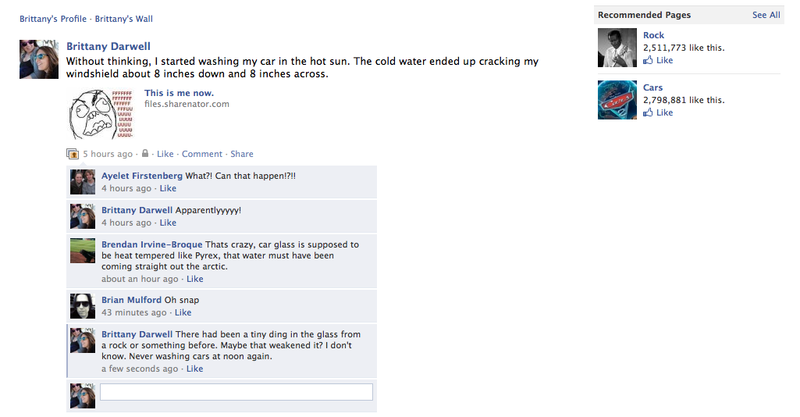 In the meantime, I’ll be using the Better Facebook plugin to sift out some of the noise. Thinking about social media in terms of apps and virality goes against what’s best about this technology. The beauty of platforms like Facebook is that brands and people can have a social exchange, not just a business exchange. But this only happens when you have humans assigned to monitor the web and respond on behalf of your brand. It doesn’t happen through Facebook apps, Twitter contests or YouTube videos. Those things might supplement a campaign, but they are not a social media strategy and they are not a substitute for quality community management. Community managers maintain a brand’s presence online, sharing content and responding to feedback. This usually includes making posts to the company Facebook page and replying to tweets, but should not leave out monitoring and commenting on blogs, YouTube and other places where your brand is mentioned. Community managers simultaneously serve the people and the brand, understanding the two aren’t at odds and finding ways to provide value to both. Community managers allow companies and individuals to relate in a very human way, a connection that is not possible through mass marketing. Think about the love and loyalty people feel toward certain restaurants, salons or cruise lines. People feel stronger about these services than they do about products because of the human difference. Apple brilliantly created Apple Stores with ‘Geniuses’ to help you find new products and fix your old ones. Forget the “I’m a Mac. I’m a PC” ads; this gives you the clearest idea what type of person Apple is and creates a deeper connection to the brand than someone would get buying a laptop from a general electronics store. A person might have a great experience buying a Dell at Best Buy and return when they need a new computer, but their loyalty is then likely stronger to the store than to Dell. The point is human interaction does the most to affect how we feel about companies. Social media platforms give all brands the opportunity to have meaningful interactions with people and turn any product into a service. For instance, Kotex uses its Facebook page to answer questions about women’s health. For now, good community management is something that will set a company apart. Think of the attention Southwest has gotten for their diligence on Twitter. Most people are still surprised and delighted when a company responds to them via social media, but soon it will be an expectation. All the apps and contests and Facebook ads can’t replace the benefits of human interaction. Companies need to invest in community management. Facebook is testing a way to combine posts that mention the same topic. This has implications for the future of our News Feeds, which are in need of noise-control and a means of making shared items more useful to us. Think about how this type of post would be able to provide a better sense of what matters and what people are talking about on a given day. Whether it’s ’15 of your friends posted about Japan’ or ‘4 of your friends posted about Crazy, Stupid, Love,’ suddenly those posts have more context and meaning. I can’t find a logical reason to switch to Google+. I’ve heard all the arguments for Circles, and I’m telling you, they’re not a Facebook killer. 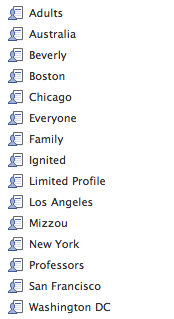 Despite having a better UI than Facebook lists, they are just as much mental work to create and use. They require thought where Facebook has shown simplicity wins out, and they fail to solve the problems their proponents think they do. About a year ago I went through all my Facebook friends and deleted anyone I wouldn’t stop to talk to on the street. I put the remaining friends in lists according to how I knew them or where they lived. Though this was a process (and Facebook has made it easier since then), it is simple to maintain and makes me feel I have full control over how I share online. The thing is, I almost never use these lists. It’s rare that I want to post something on Facebook that I wouldn’t want all of my friends to see. Though I’m confident I could post photos my family wouldn’t see or say something my coworkers couldn’t read, I haven’t found a need. The ultimate privacy setting is, of course, your own discretion. All the lists and circles in the world won’t protect you if you’re adding people you can’t trust or sharing items you really don’t want certain people to know about. The other side of the pro-Circles movement is less about privacy and more about filtering noise. 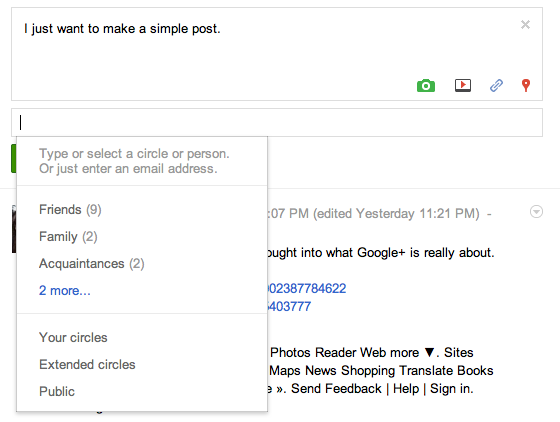 Some say they like Google+ Circles because they can share selectively with their work friends, tech friends, basketball friends, foodie friends, etc. They don’t want to bother the techies with the food photos or the basketball friends with work talk. Though this makes sense in real life, it doesn’t work online. We share online because we want to be recognized. Why would we limit our reach? I love when someone I haven’t talked to in a while likes my Facebook photo, or when someone I wouldn’t have thought would have been interested in something comments on a link I shared. Besides, it’s annoying to decide who to share each post with. Play around with Google+ and you’ll see. There is certainly a problem of too many irrelevant posts in people’s News Feeds, but Circles don’t solve that. The feed from your foodie friends will still include much more than photos or talk about food. I’d love to see Facebook or Google (or anyone) create a solution that lets me see particular types of posts or information when I want to see it. For instance, all my friends’ mentions of movies this weekend or all the songs my friends shared this month. That would be a gamechanger. But so far, Google+ does not offer compelling reason to switch from Facebook. Some people talk about “starting fresh,” adding friends more selectively and organizing them from the start. Sure, but that seems like just as much work as cleaning out your Facebook friends. 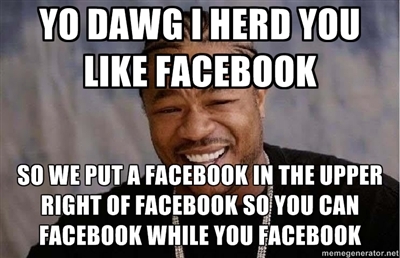 Besides, you’ll feel a little silly when Facebook comes out with a solution that sorts your friends automatically. They already have an algorithm that suggests friends to add to certain lists. 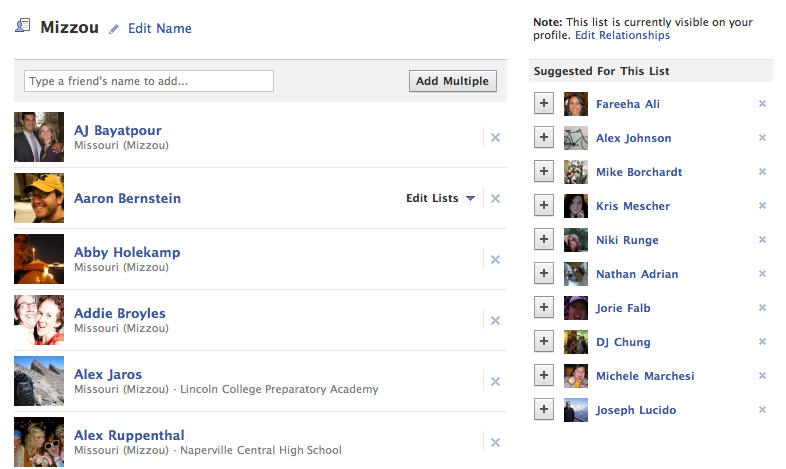 I wouldn’t be surprised to wake up one day to find Facebook has grouped all of our friends for us. But then, how often will anyone use them anyway? Facebook is testing a new way to rate Places that is reminiscent of another successful Zuckerberg project, Facemash. Some users who have checked into Places, or who have been tagged in checkins, are seeing a new sidebar asking “Which place do you like better?” When a user chooses a place, the section pits two more places against each other, and so on. When Facebook launched Places in August 2010, it was clear that the product could one day have options to rate and review places a la Yelp. Since the site has such a massive user base, there is a great opportunity for Facebook to own the social recommendation space by making a product that becomes even more widely adopted. As it is now, lots of people who read Yelp reviews have never written one themselves, nor have their friends. A lot of companies are making social sites and apps to share information and recommendations, but none have been able to solve the problem of participation inequality. I believe Facebook is more likely than anyone to figure this out. This latest test shows just how clearly Facebook understands human behavior. 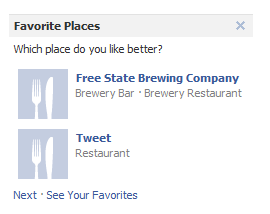 If they had asked me to rate Free State Brewing Company, I might have done it only because I like that place a whole lot and want people to know about it. If they asked for a review, I might not have because I like that place a whole lot and would want to take some time to write a great review. Instead, Facebook made the question so simple and compelling that I continued to vote until I didn’t have any more checkins to vote upon. This may not be the ultimate way Facebook implements recommendations, but it at least shows that they get it. If you use Facebook for business, you have to be able to adapt quickly to new features and platform changes. But more fun than playing catch-up is anticipating changes before they happen. So far my prediction that Facebook would focus on improving the admin experience in 2011 has held true. I’m betting the company’s next major initiative will be real-time ad targeting based on posts and comments, not just Likes and Interests. Facebook implemented a real-time commenting system in January, and now it seems to be testing an algorithm to feature content according to words in those comments. When I hit enter on a comment that included the words ‘mmhmm’ and ‘facebook,’ the sidebar refreshed and I was served recommendations for Mmhmm and YouTube. I have since had this same thing happen when I have left a comment including the name of the artist ‘Miguel.’ The recommended pages refreshed to show Miguel and similar artist Drake. Another time when I my comment included the words ‘rock’ and ‘cars,’ I got less relevant results. I imagine Facebook is testing this algorithm first with Recommended Pages, but could apply this to advertising by the end of the year. It was last year that a presentation including reference to real-time ad targeting was leaked. This would revolutionize Facebook ads. As it stands now, ads are targeted to ‘Likes and Interests.’ You cannot add your own words to Facebook’s targeting section. See below how Facebook won’t let me target the word ‘help,’ only pages, activities or interests that people already have in their profiles. This would have to change, but you can imagine if Facebook offered targeting based on real-time keywords, it would be similar to search but might be most similar to ads that are served based on the content of your emails. The advantage with Facebook being the option for photos to attract people’s attention and the addition of social recommendations (5 of your friends like this). Anyway, I’m excited about the possibilities for this product.